Amelia Boynton, who was born in Savanna, Georgia on August 18, 1911, was a civil rights activist who championed for voting rights and beaten for helping to lead the 1965 civil rights march, which became known as Bloody Sunday. 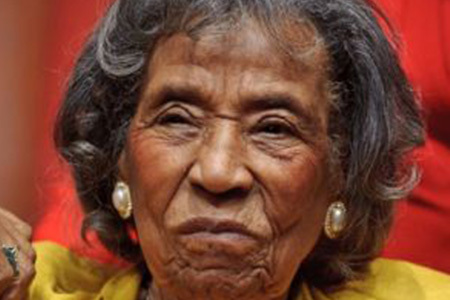 She was the first African-American woman to run for a Democratic seat in Congress from Alabama. Although she didn’t win her seat, Boynton earned 10 percent of the vote. A little Background History of Amelia Boynton! Boynton was actually born Amelia Platts to George and Anna Platts of Savannah, Georgia. Both parents were African-American, Cherokee Indian and German descent. Boynton attended Georgia State College, which is now Savanna State University, and later transferred to Tuskegee Institute in Alabama where she graduated with an economics degree and later took a job with the U.S. Department of Agriculture in Selma, Alabama. Amelia Boynton met her husband, Samuel Boynton in 1936, who was a co-worker at Dallas County. Both had a deep passion to improve lives of the African-American community, particularly sharecroppers. The couple later married in 1936 and had two sons, Bill Jr. and Bruce Carver. Amelia and George worked together for three decades towards achieving voting, property and education rights for the poor African Americans of Alabama’s farm country. Boynton’s early activism included co-founding the Dallas County Voters League in 1933 in addition to the African-American voter registration drives from the 1930’s into the 1950’s in Selma, Alabama. After her husband died in 1963, Amelia continued to improve the lives of African-Americans. In 1964, Amelia Boynton asked Martin Lugher King Jr and the Southern Christain Leadership Conference (SCLC) to come to Selma, Alabama to help in the struggle for African-American suffrage, and King was pleased to accept. Soon after, he and the SCLS set up headquarters at the Boynton’s Selma home were the Selma to Montgomery March was planned. After Samuel Boynton passed away, Amelia eventually married a former Tuskegee classmate James Robinson and moved back to Tuskegee. After Robinson died in 1988, Boynton remained in Tuskegee. In 1990, Boynton was awarded the Martin Luther King Jr Medal of Freedom. In 2014, our new generation learned about Amelia Boynton and her contribution to the Civil Rights Movement from the Oscar-nominated film Selma. One year later, Boynton was honored as a special guest at President Barack Obama’s State of the Union Address in January of 2015. 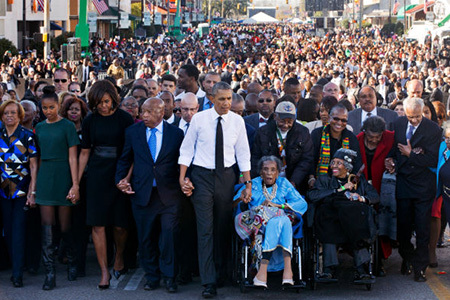 In March, Amelia Boynton held hands with President Obama as they marched alongside fellow civil right activist Congressman John Lewis across the Edmund Pettus Bridge, marking the 50th anniversary of the Selma to Montgomery March. 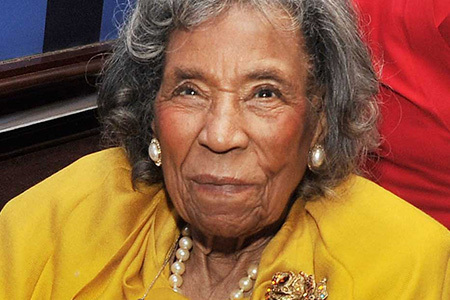 I hoped you enjoyed learning a bit of history about Amelia Boynton and what she has given for African-Americans. If you have, please share.